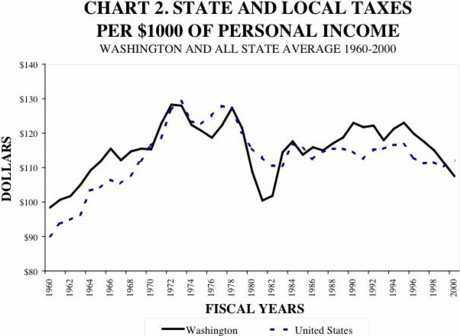 For months now Tim Eyman has been touting the “statistic” that property taxes in WA state have increased from $1 billion in 1980 to $6.25 billion in 2003, a figure he calls “obscene.” He even used a chart based on this stat as the backdrop for his lonely press conference on Monday. What is really obscene is that this misleading piece of propaganda is repeated in the media without any context or analysis. So I want to give you a preview of some research I plan to post later this week to TaxSanity.org, that examines Tim’s chart and dispassionately explains why it is a meaningless piece of crap. Apart from the fact that state and local taxes as a percentage of personal income have actually been declining steadily for years, one thing really jumps out from this chart… that Tim’s start date of 1980 is intentional misleading, as it represents an anomalous twenty-year low in tax rates. Indeed, if you start one year earlier, in 1979, tax burden has clearly and dramatically decreased. Tim’s figures are taken out of both historical and economic context to present the false impression that government growth is exploding out of control. It fails to consider, population growth, inflation, loss of federal funds, and shifts of revenues from one tax source to another. And oh what a difference a year makes. According to the Washington State Tax Structure Committee (chaired by Bill Gates Sr.) and every other reputable source, the economic figure that most close tracks growth in demand for public services is growth in personal income. Personal income is also the only number which permits a true measure of tax burden, for obvious reasons. It is not surprising that the entire premise of Tim’s tax revolt is built on lies, but it is disappointing that nobody has bothered to expose it sooner. I don’t get many comments on my blog entries, but I sure do get a lot of email, often of the angry, misinformed persuasion. Many of these epistles have common themes, so I thought I’d share a few of my responses in the hope of encouraging a bit more originality. All names have been changed to protect the guilty. To John, who demanded I reveal my Tribal connections, I replied that I was a Levite. To Margaret I wrote that yes, I do indeed have the right to write the things I do, but that I appreciate her offer to visit me in prison. To Adolph I apologized if he perceived an anti-German bias when I jokingly referred to the author of an anti-semitic email as “Klaus,” but hoped he would excuse me if I’m still a little sore over the fact that they did kill six million of my people. To Steve I wrote to agree with him that I would not want the government telling me what I can or cannot do in the privacy of my own bedroom, although I could probably use an occasional reminder to flip my mattress. And finally, to Kevin I thanked him for writing, but regretted that I was not limber enough to honor his request. Shouldn’t a “news conference” actually generate news? By now you’ve likely seen the TV news clips or read in the papers that Tim Eyman delivered enough signatures to the Secretary of State to qualify I-892 (Slots for Tots) for the ballot. I was present for the festivities, so I thought I’d just pass along a few first hand observations. Apparently, nothing says widespread public support like spending half a million dollars of gambling industry money on paid signature gatherers. But the most telling indication of I-892’s popularity was the fact that Tim showed up alone. Tim then stood before the cameras to briefly spout lies. He even brought a chart as a visual aid — or as it is technically known in the public relations business, more lies. Finally, he took questions from the media — a rather one-sided exchange considering he wouldn’t actually give any answers in return — before sprouting horns and wings and flying back to his fortress of evil. Just kidding about the horns. In the end, the battle over I-892 will be a battle over the truth. Tim is going to try to sell this as a tax cut initiative, whereas anybody with a shred of honesty is going to explain that it is about the most massive expansion of gambling in state history. If the truth wins, I-892 loses. As you’ll surely read in Monday’s paper, initiative entrepreneur Tim Eyman has collected over 230,000 signatures, more than enough to qualify I-892 (Slots for Tots) for the ballot. Eyman extolls the virtues of “direct democracy” but there is nothing direct or democratic about Canadian and Nevadan gambling conglomerates spending half a million dollars to buy their way onto the WA ballot with lies. I-892 puts 18,255 slot machines into our neighborhoods, and if voters understand this in November, it will fail. While Tim Eyman tries to characterize I-892 (Slots for Tots) as equal treatment for mom & pop bowling alleys [Bowling for dollars] its largest contributors are a handful of gambling conglomerates, mostly foreign and out-of-state corporations. Indeed, according to a recent article in the Seattle P-I, I-892’s biggest backer is the Great Canadian Gaming Corporation, which has sunk at least $62,500 into the effort through the end of May… possibly in violation of federal election laws. The allegations came under oath in sworn depositions from two former long-time Great Canadian employees who were subpoenaed to testify as part of a lawsuit from a Texas corporation. Allegiance Capital claims that a joint venture with Great Canadian went sour due to profit skimming and prostitution onboard a Hong Kong based floating casino. With hundreds of paid signature gatherers hawking I-892 in the final week before the deadline, voters deserve to know what kind of company is paying them. This is a company accused of profit skimming and fraud, of promoting prostitution, and knowingly allowing loansharking in its casinos. It is a publicly traded corporation that hires a private investigator to harass the estranged wife of its chairman. But most of all, this is a foreign corporation attempting to influence a Washington state election. And if they can’t be trusted to obey the laws in their home country, they certainly can’t be trusted to obey the laws in ours. If I-892 were to be judged by the company it keeps, it would likely be convicted of several felonies. I just finished listening to Jennifer McCausland debate Tim Eyman on the John Carlson Show. As always, Tim was an arrogant, lying prick. Jennifer was well-informed, persuasive and polite. Maybe too polite. Jennifer heads Second Chance Washington, an organization dedicated to securing permanent funding for treatment and prevention of problem gambling. Tim, of course, represents his own greedy self-interests… and these days, the greedy self-interest of Canadian and Nevadan gambling conglomerates. I had to chuckle at Tim’s almost-clever claim that I-892 (Slots for Tots) provides “$8 million to $11 million biennially” to treat problem gambling. He’d been claiming $11.5 million annually since day one, and when Mark Sidran pointed out his math error on the Dori Monson show last week, Tim still refused to concede that $400 million times one percent equals $4 million. So now I suppose Tim is saying that he meant biennial all along. But the ickyiest part was listening to Tim attempt to pander to John by saying I-892 was in the spirit of I-200, the anti-affirmative action initiative that Tim sponsored, but which John shepherded onto the ballot and past voters. Yeah it’s about time us white folk get the same breaks long given to the tribes. As if listening to KVI didn’t make me feel dirty enough. I need to take a shower. -Initiatives: Increasingly and alarmingly, the state of Washington is using initiatives as a substitute for enactment of law through deliberative legislation. Though a product of the state’s populist traditions, the initiative has exceeded its designed role as a citizen’s check and balance. I suggest we consider several reforms to lift the bar of eligibility before an initiative can qualify for the ballot: Increase the number of signatures required. Disallow paid signature gatherers or at least severely restrict their activities. Use explicit, simple ballot language so the consequence of passage is clearly understandable. Require that a fiscal note accompany every measure detailing the financial impact, and in case of a new or expanded program, require an identified revenue source. All of these suggestions are reasonable enough that they should receive a fair debate, instead of being instantly squashed by the kind of political grandstanding that usually accompanies any suggestion of initiative reform. Defenders of the current system extoll the virtues of “direct democracy,” but there is nothing especially direct or democratic about a process where citizens only get to vote on those initatives with the hundreds of thousands of dollars of special interest money necessary to buy enough signatures to get on the ballot. I spend a lot of time criticizing the media for their factual errors. For example, I keep reading that I-892 (Slots for Tots) allows about 14,000 slot machines, when in fact, it allows exactly 18,255. So it’s only fair that I correct my own errors. And I wouldn’t have caught this error if not for a detailed article in today’s Seattle Times exploring initiative campaign expenditures: “School-initiative supporters lead in fund raising.” So kudos to the Times, and healthy serving of humble pie to me. So I apologize if I implied Junior’s expenditures were REALLY stupid, when in fact they were just plain stupid. Increasing access to gambling increases addiction. In a national study, residents who lived within 50 miles of a casino were twice as likely to be problem gamblers than those who did not. I-892 would put 18,255 slot machines into over a thousand neighborhood bars, restaurants and bowling alleys across the state: nearly all of us will live within 50 miles of the most addictive form of gambling ever devised. Tim Eyman and the foreign and out-of-state gambling conglomerates bankrolling his initiative, should not be rewarded for their callow disregard for public welfare. Kudos to the TNT for taking such a strong stand on this very important issue. Why did God create Kemper Freeman Jr.? Somebody’s got to pay retail. I-883 had been one of the season’s best financed initiative campaigns… most of it Junior’s money. With virtually unlimited personal funds, and a dishonest yet misleading quarter-truth of a sales pitch (“this initiative opens HOV lanes to everybody,”) I-883 seemed certain to reach the ballot. Of the over $320,000 spent through the end of may, only $42,000 is listed as going to “voter signature gathering,” while a whopping $190,000 was pissed away on “management & consulting services.” The only conclusion is that either the campaign has hidden signature gathering efforts under the wrong expense category, or that Junior was royally reamed by his consultants. If he had hired me as a consultant I could have saved him about $189,000 by advising him to fire me and SPEND ALL HIS DAMN MONEY ON SIGNATURES! This calls into question the campaign’s claim that they had gathered half the 197,000 required signatures. With a street price of a buck each, the firms had to be charging at least $2.00… and with Junior’s penchant for paying retail, probably much, much more. So it is unlikely they collected more than a tenth the required number. This also calls into question Junior’s business acumen, and begs the larger question of why we should trust this man to re-prioritize our state’s multi-billion dollar transportation budget when he can’t even prioritize a few hundred thousand dollars in campaign expenditures. If our transportation spending were to follow Junior’s blueprint, for every $1 billion in new roads we’d spend $4.5 billion on management and consulting fees. Tim Eyman likes to say that government never reforms itself when it is “fat and happy.” Looking at the campaign finances of Tim, Junior and their fellow initiative sponsors, it looks like there is plenty of cheerful corpulence to go around. Proponents of our state’s for-profit initiative industry defend paid signature gathering as protected by our First Amendment right to free speech. Well, their speech may be free, but it certainly ain’t cheap. An unscientific survey of paid signature gatherers yesterday showed that the street price of signatures has more than doubled in the final few weeks of the petition season, fetching between $1.75 and $2.50 a piece. We can only estimate the markup, but one can safely guess that the firms are charging between $3.00 and $5.00 a signature, possibly more. That adds up when you need 200,000 signatures to qualify for the ballot. Many voters have the impression that direct democracy is somehow more democratic than representative democracy, because the people get the final vote. But we only get to vote on those initiatives that have hundreds of thousands of dollars of special interest money to buy their way onto the ballot. In that sense, money has become a freer sort of speech than speech itself… which only serves to cheapen our democracy even as it makes it more expensive. For those keeping score, Tim Eyman sent two emails to supporters yesterday, and neither mentioned Jennifer McCausland um, borrowing Tim’s list to make a personal appeal not to support I-892 (Slots for Tots.) Not surprising… what was he going to say, problem gambling is good? Methinks the liar doest protest too much.